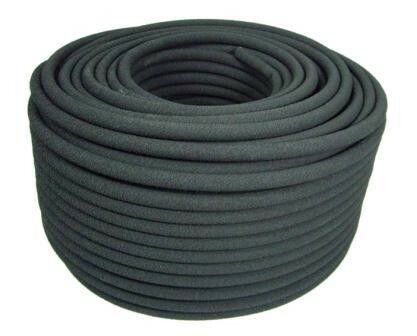 This low-pressure, high-efficiency rubber diffuser hose is made for aquaculture. Diffuser lengths of up to 20' per inlet are possible at low airflow rates. Tubing has a good oxygen transfer rate (average 2.5% per foot of water depth) with a head loss of only about 1 psi. This tubing is compatible with both regenerative blowers and linear air pumps. The gas flowrate is an average of .1–.6 cfm/ft; higher and lower flows are possible. Produces a strong volume of medium-size bubbles (approximately 3 mm). For connections, use barb fittings with clamps. Hose ends may be heat-sealed or fitted with a plug and clamp. To counteract buoyancy, hold-downs or weights are required. No warranty due to individual clogging and fouling possibilities.